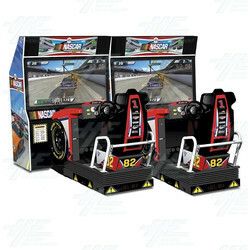 The NASCAR Full Motion DX Twin Arcade Machine delivers a very high energy, fun and highly addictive racing experience. Players can choose from some of NASCAR's celebrated drivers like Jeff Gordon, Dale Earnhardt Jr, Tony Stewart, Jimmie Johnson, Kyle Busch, Greg Biffle, Matt Kenseth, Denny Hamlin, Jeff Burton, Kasey Kahne, Ryan Newman and Kurt Busch, then race on the most popular NASCAR tracks from Daytona to Indianapolis, Bristol and Talladega. Each race will include 30 different NASCAR drivers and cars. Players listen to their pit boss as they zoom around the various tracks at track speeds in excess of 200 mph. The NASCAR racing game has been designed for both "pro" drivers and "newbies", with "computer assisted" driving technology to help appeal to young and casual players alike, in addition to the in-depth playing levels for the more seasoned player. The deluxe motion cabinet houses a 57" LCD flat panel monitor, roll bars, and control panel delivering completely realistic NASCAR look and feel, down to the Goodyear tyres. Players can choose from some of NASCAR's celebrated drivers like Jeff Gordon, Dale Earnhardt Jr, Tony Stewart, Jimmie Johnson, Kyle Busch, Greg Biffle, Matt Kenseth, Denny Hamlin, Jeff Burton, Kasey Kahne, Ryan Newman and Kurt Busch, then race on the most popular NASCAR tracks from Daytona to Indianapolis, Bristol and Talladega. Each race will include 30 different NASCAR drivers and cars. Players listen to their pit boss as they zoom around the various tracks at track speeds in excess of 200 mph. assisted" driving technology to help appeal to young and casual players alike, in addition to the in-depth playing levels for the more seasoned player. The deluxe motion cabinet houses a 57" LCD flat panel monitor, roll bars, and control panel delivering completely realistic NASCAR look and feel, down to the Goodyear tyres.